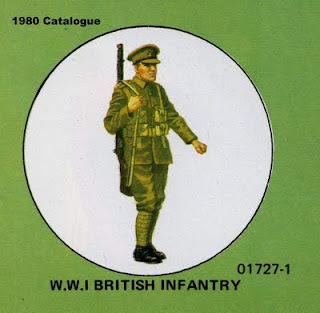 Another set I liked as a kid, some people whinge about the wiring party, but anyone whose used 'Danet Wire' knows it still comes on rolls like those depicted, and remains to this day a basic item of 'defence stores' in the British army. 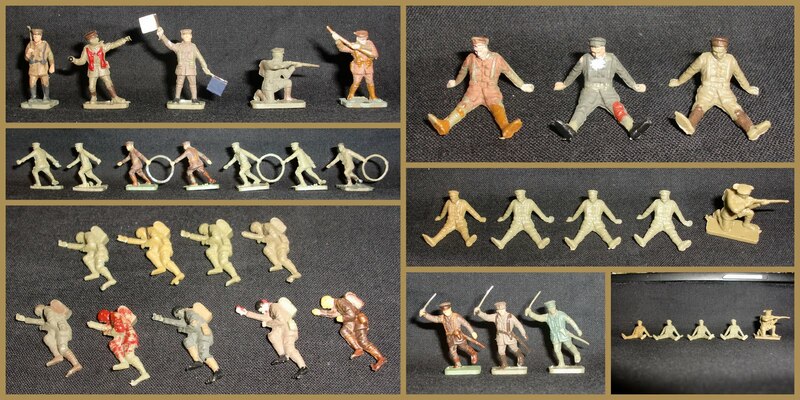 Whole Sprue, this is a modern re-issue by/for HaT/Heller/Humbrol/Hornby but happens to be close to the original colour. A set, set-up as a kid would way back when, the support weapons sets were a complete bugger to keep set-up, and a hot pin was often resorted to as the last resort of a desperate parent! 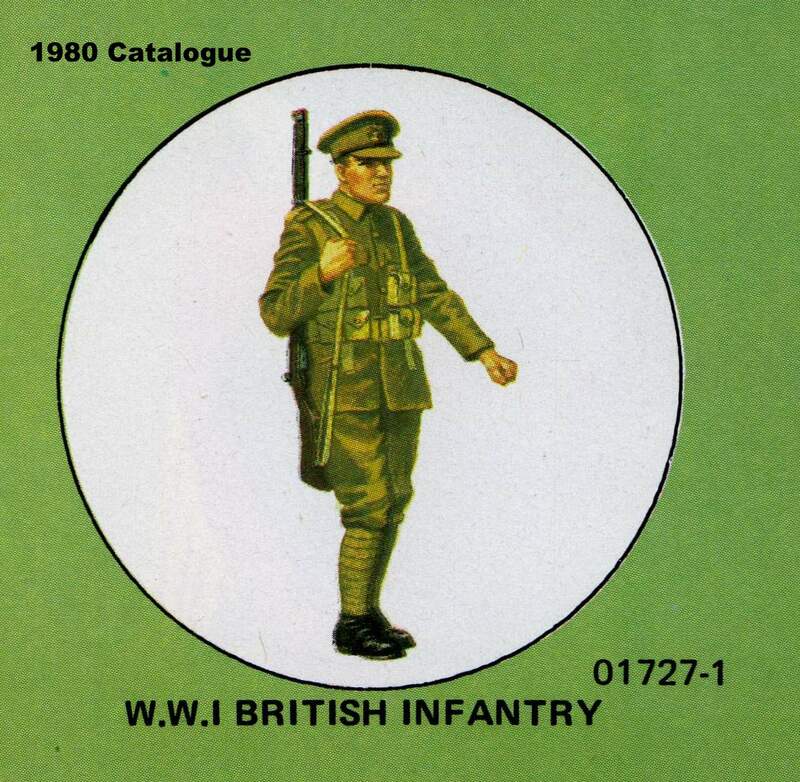 1967/4th catalogue, the first mention of the British infantry, the Germans got a picture, but a quick perusal of that entry will show it wasn't quite what it seemed! ...except the Brits got a full frontal box-art image the next year! Then came my favourites, the 'line-up' with one of each pose attacking the reader as he perused his catalogue and built mental Christmas and Birthday wish-lists! 1980 sees loft-conversion minimalism, but at least a decent picture (we'd had what you'd now call 'thumbnails' for nearly a decade), taken from the long boxes, this was the swan-song for Airfix, who were on the way out. 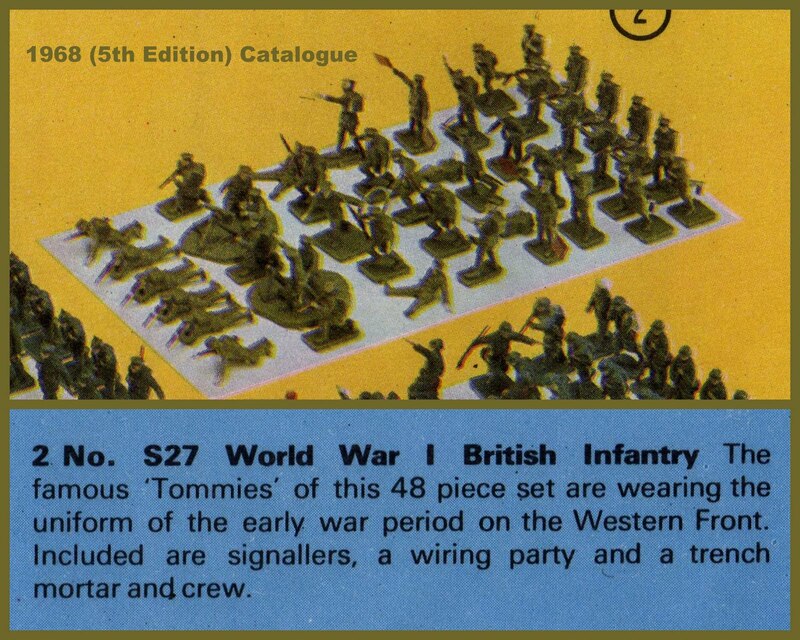 1982 German catalogue, again the little pictures from the back of a long-box, blown-up. 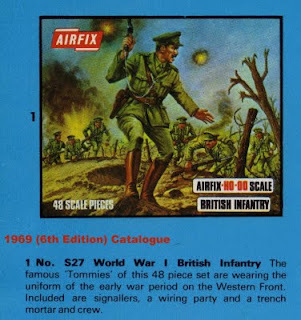 The Franco-Irish marketing conglomerate that owned the Airfix brand-name and assets thought they'd have a go, I guess someone in the graphic department was very pleased with the 'eighties' sky-scape! It's St. Elmo's fire! 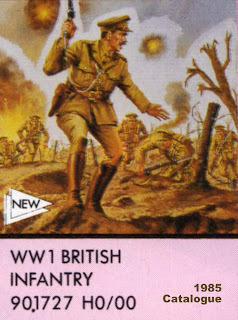 Right Lads, when we get near the German trench I want you all to switch hands! 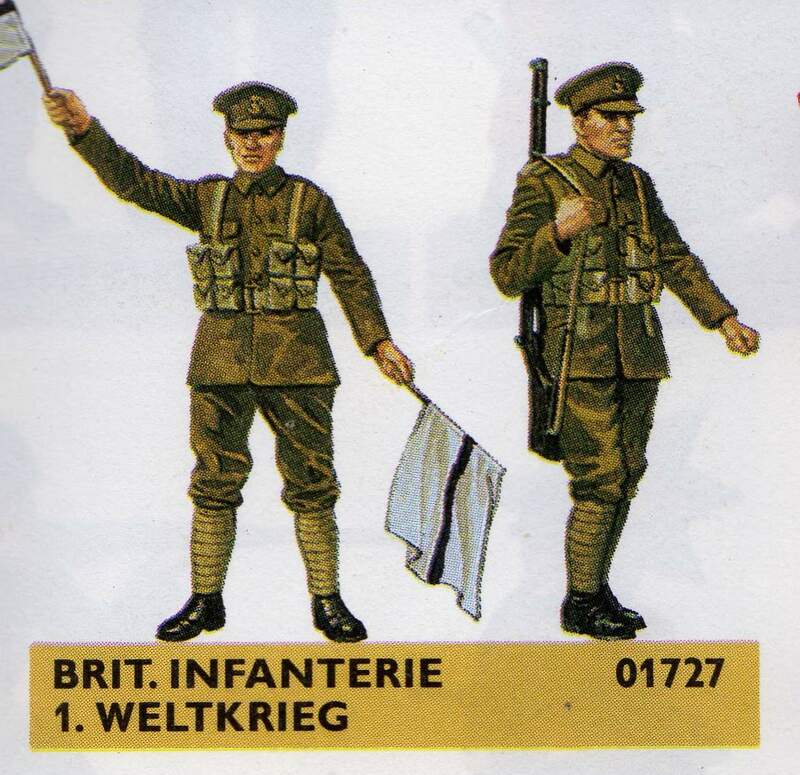 Airfix/Stadden, the similarity is clearer on the kneeling figure, but a lot of the cloth-folds and so on are typically Stadden, however they are finished to a higher standard, but that will be due to the larger size of the Airfix masters while the Tradition stuff would have been sculpted same-size as the final moulding. 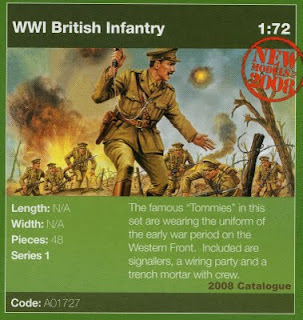 HaT, one of three box types for WWI 7000-series re-issues, I don't know if they did all sets in each box? 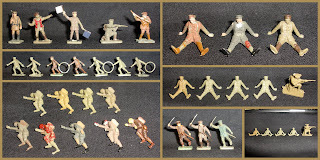 Plastic colours and painting; the wiring party is often damaged, but can be turned into two more guys flinging themselves pointlessly across no-mans land, or a single guy dragging a roll of Danet. 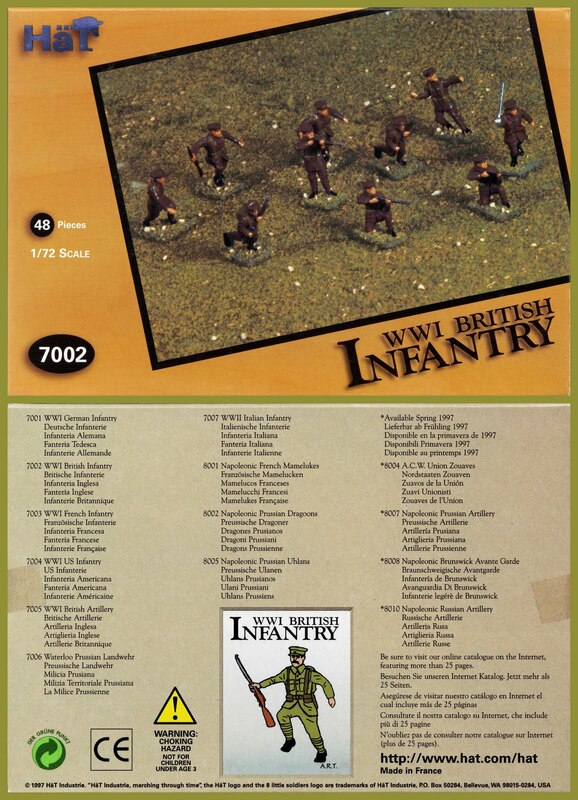 Support weapons teams, hard to get together, but nice little vignettes and nothing like them had been seen when they came out, people forget, with all the Rumanians and Sherden warriors available to day, how totally radical these where...now just pure nostalgia! 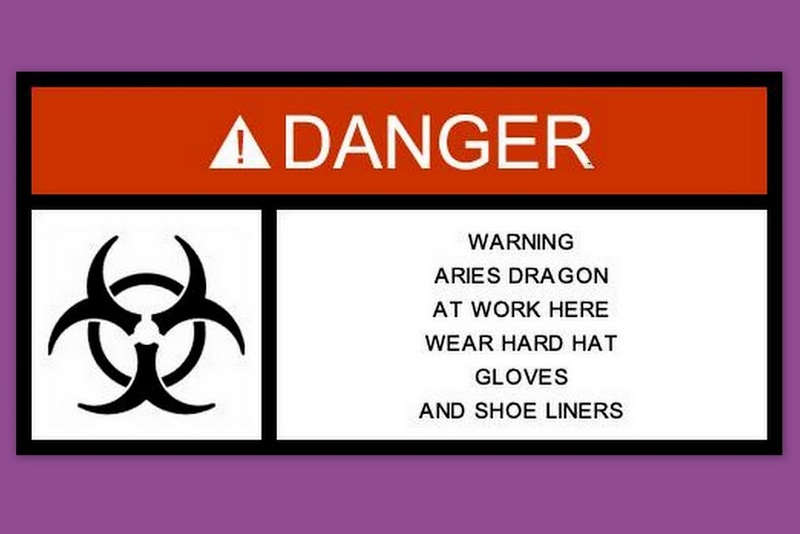 Upper shot - One of the real problems with these is the natural choke-point or accidental 'gate' in the moulding at the ankle which leads to lots of the lying firers turning-up with no foot! Although the instructions in the modelling press and associated books always stated 'use a sharp craft knife to separate the figures from their runners', the truth is, most pre-teen boys given these figures soon learned to twist the figures off and then snip the snub/stub residue with a finger-nail...having never read the modelling press! When they were given this set (or the British Grenadiers, French Napoleonic Infantry...and others! 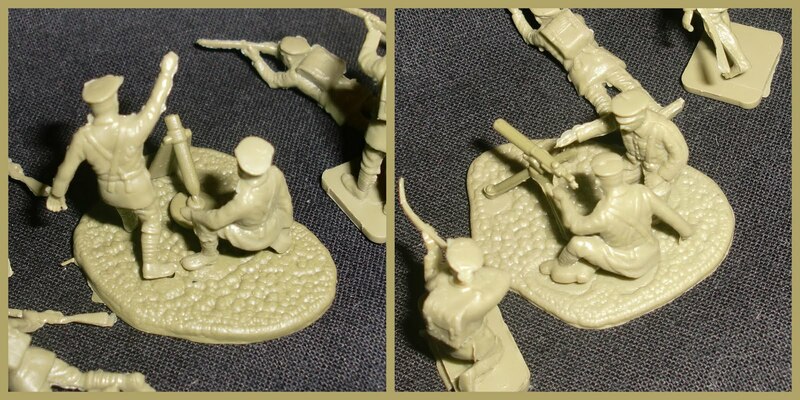 ), they proceeded in the usual manner...loosing feet in the process! You can see they have both failed in the same place, so there was also clearly a weak-point there, created in the moulding process. Below them are a nicely-painted set of OBE's...in an odd colour scheme? 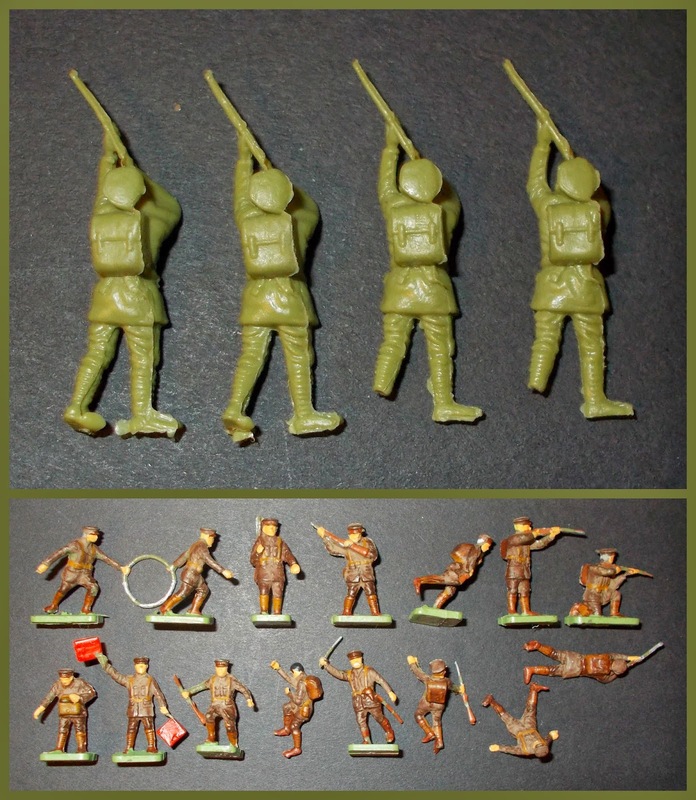 Perhaps Chinese troops or something? 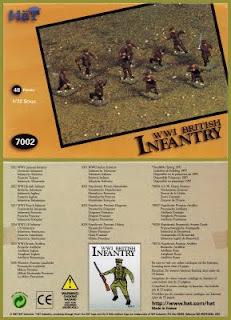 Yeomanry? 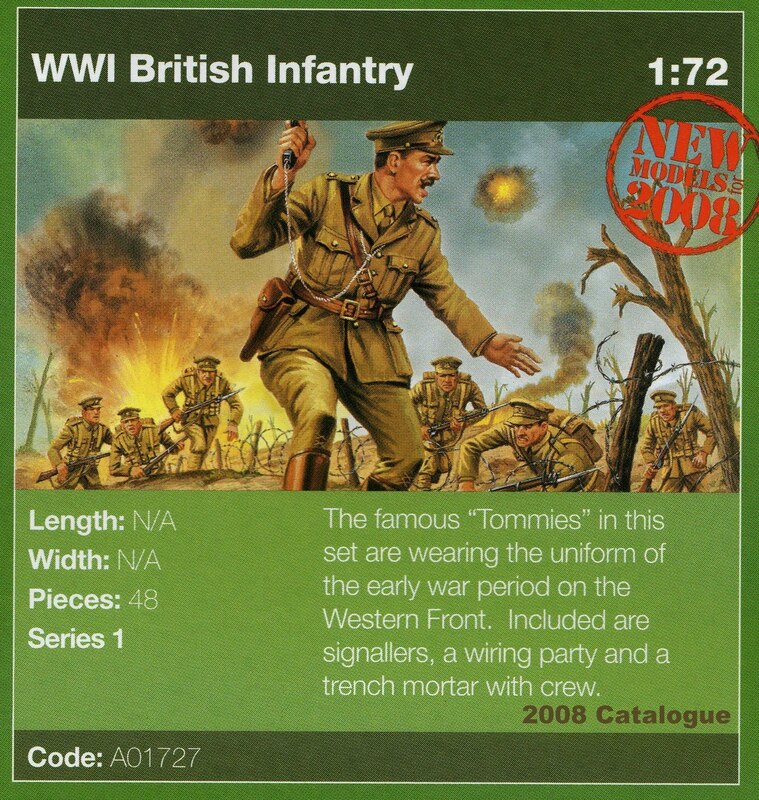 Emhar from Pocketbond, as disappointing as the German Infantry set, and the influence of Airfix definitely present in the ammo/tool-box party!